It was earlier known as Awadh. A city famous for its ‘tehzeeb’ (courtesy) it has often been referred to as the “City of Pehle Aap”. In these modern times, “Pehle Aap” (First you) has almost lost its meaning and ‘Pehle Mai’ (First me) or ‘Pehle Hum’ ( First us) appears to make more sense these days. On an official visit to the city some years ago, I set out to see some of the sights of the city and also search for the bungalow in which I had lived as a child. After going up and down the Mall Road road several times I gave up —nowhere could I see the cascade of pink bougainvilas by the gate, which was my strongest memory. It was then time for Iftiyar the driver of my hired Ambassador car, to take over the task of driving me to see some of the sights of old Lucknow. Like most visitors to this historic city, we began with the Asafi Imambara Complex, which comprises of the magnificent Imambara, the mosque, the Shahi-Baoli and the Rumi Darwaza. It has been said that all these as well as the Naubat Khana and the Sarai, were all started simultaneously in 1884 by Nawab Asafud-Daula. Located on the slopes of a mound, where the Machhi Bhavan Fort, earlier existed, the building of the Imambara was undertaken during Avadh’s worst famine –to ensure work and an income for the citizens. The Nawab himself participated in the building process to encourage members of noble families to join in this holy task. Designed by Kifayatullah Shahjahanabadi (of Delhi), the Imambara is said to have cost one and a half crores of rupees, with 22,000 workers engaged day and night in its construction. The main building is a massive single storeyed structure. The central hall almost 50 metres long and 16.15 metres high, is considered one of the greatest architectural achievements of India, its most important feature being the vaulted ceiling, created without any pillars or even the use of iron or wood. The southern part of the Imambara consists of 489 identical openings from the first to the third storey. These openings were created at regular intervals for light and air, with ascending and descending steps at different levels. This complicated arrangement has created a labyrinth, where people often lose their way – leading to it being referred to as the ‘Bhulbhullaiyan’(a maze). The spectacular ‘Rumi Darwaza’, is also another splendid creation, an architectural masterpiece! It consists of a lofty archway more than 18 metres high, with an elaborate cupola and low walls. This splendid archway, is said to have been an attempt by its architects to improve on the famous gateway of Constantinople (now Istanbul). This massive gateway is built with the famous ‘ Lakhauri’ bricks and thick lime plaster. While the earlier floral motifs in the inner arch are no longer to be seen, a few remnants continue to remind us of the splendour of this enormous gateway. An interesting Mughal tomb said to date back to the time of Jahangir (1605 – 1628), is the ‘Solah Khamba’ —which contains the graves of the descendants of Shaikh Abdur Rahim. Built on a rectangular platform, the tomb is 0.94 metres high and named after the Mughal architectural form of 16 pillars, each fluted with ornamental bases. The platform has a red sandstone floor and its side walls are decorated with the popular vase and goblet motifs of that period, also seen and seen on the tomb of Itmad-ad-Daula at Agra. Claude Martin, a French soldier rose to the rank of a Major General in the British East India Company. Keenly interested in architecture, Martin created a number of European style buildings in Lucknow. These include ‘Kothi Bibiapur’, Musa Bagh, Kothi Farhat Baksh, Shish Mahal and Constantia—which later came to be known as La Martiniere, one of India’s best known schools. Also worth mentioning is Musa Bagh (originaly ‘Monseiur Bagh’) overlooking the river Gomti, a pleasure palace made by Martin on behalf of Nawab Asafud —Daula. The ruins of the palace with an overgrown garden remain to remind us of the grandeur of the past. For his own residence, Martin built ‘Kothi Farhat Baksh’, a two-storyed mansion considered to be one of the earliest examples of European style architecture in Lucknow. Nawab Saadat Ali Khan is said to have bought this mansion from General Martin at a cost of Fifteen thousand rupees. ‘Kothi Bibiapur’ was built with strong European architectural features near the banks of the Gomti, for Nawab Asafud – Daula. Built with Lakhouri bricks, it was used to entertain European guests to ‘sumptious lunches’ and hunting parties. With the sun beginning to set, we reached The Residency created for the British Resident in 1775, after the court moved from Faizabad to Lucknow. By 1786, the Residency site was full of brick bungalows with flat thatched roofs, as well as more elaborate mansions for senior British Officers as well as buildings for varied uses. While the Residency is a single building, the term ‘Residency’ has been used to include all the structures in the area, such as The Treasury, The Banqut Hall, The Hospital, The School, The Racket Court, the Begum Kothi, a Mosque and Imambara. There was also the Brigade Mess as well as gardens, parks and the Cemetery. 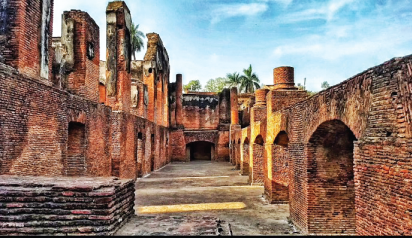 The Residency was attacked and besieged for eighty-seven days by freedom fighters under the command of Begum Hazrat Mahal in 1857. This siege remains unique in the history of modern India and almost all of the buildings in the area were badly damaged. Roofs, doors and windows were shattered and canons bored countless halls into the walls of the buildings. On September 25th 1857, after a fierce battle General Outram and General Havelock broke into the siege, but were unable to capture Begum Hazrat Mahal who managed to escape with her troops. My sight-seeing ended with a visit to the grand ‘Kaisar Bagh’ complex, constructed between 1848 and 1850, by Wajid Ali Shah, the last king of Awadh. There are two independent residences in the complex—the Chaulakhi Palace and Kothi Roshan–ud-Daula. The two gateways led to a central courtyard in which there is a Baradari, waterways and two tombs. During the war in 1857, Kaiser Bagh was used as the headquarters of the Indian forces and remained on siege for many months – during the fighting, the palaces were damaged. When the British annexed Awadh, the southern wing was demolished and a road built through the area. However, some portions of the imposing eastern and western gateways still exist, which are more European than Mughal in style. Each gate has European style parapets and cupolas while the central semi-circular archway is decorated with mermaids and Awadh’s royal emblem of fish on either side. Perhaps one of the greatest tragedies of 19th century India was the brutal destruction of Lucknow. The Residency at Lucknow, set up after the battle of Buxar which took place in 1764 CE, remained like a graceful ruin, well looked after.